Guided imagery and meditation exercises designed to enhance your performance while you meet life's challenges. People go through daily routines that are necessary to their survival — to maintaining the kind of life they yearn to uphold. They go to work to pay the bills, they do chores and run errands so the home will be comfortable for everyone, they work out to stay physically fit, and the like. In addition to these simple yet essential tasks, the individual also has his sights set on important, life-changing goals. It could be getting a degree that would help him get on the path to a thriving career. It could be investing in piece of property that will allow his elderly parents to retire in peace and comfort. Or it could be kicking a harmful habit, such as smoking or drinking to excess, so that he can look forward to more years with his young children. Whether the goal is meant to be achieved in the short term or for the long term, it is meant to generate a desired result — and achieving this result depends largely on the person’s ability to set goals and to take the necessary steps toward successfully meeting those goals. 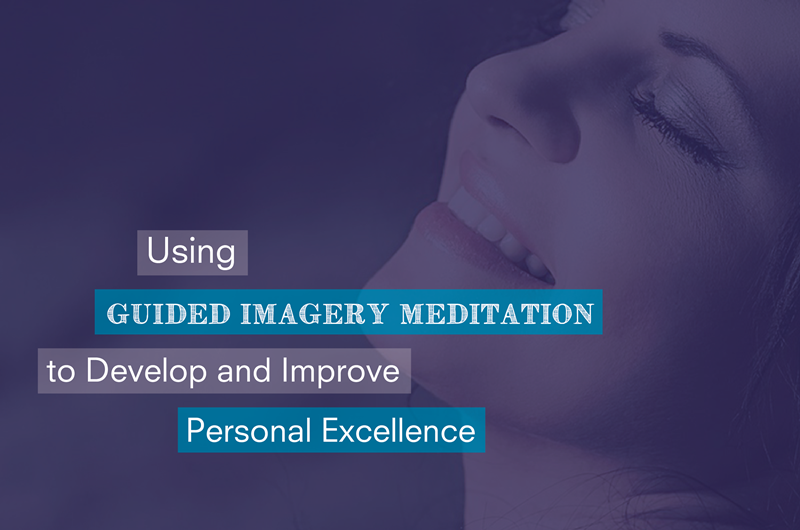 It’s all a matter of cultivating your personal performance — your individual idea of excellence — and you can attain this with the help of guided imagery meditation. Motivational speakers, therapists, life coaches and other individuals who promote self-development and enrichment often recommend visualization as a key exercise that will help people achieve their goals. It’s not hard to see why — by creating a mental picture of what you desire to achieve, you can focus better on what you need to do. Guided imagery meditation, however, takes that exercise up a notch. It’s not just about fixing an image in your mind and channeling all your energy toward it. It’s about making use of all your senses — as well as your memories, emotions and other stimuli — to help mobilize both your conscious and pre-conscious processes and take you closer to your intended goals. How should you go about the meditation? To accomplish your desired end, you can begin by using detailed imagery associated with your goal. Is it a skill or behavior that you want to adopt? Is it a milestone you wish to surpass? Is it a situation that you want to be part of? Consider your goal in careful, thorough detail. Think about what you would look like, what you want to say, how you would sound while delivering your words, how you would move, how people will respond to you, what you would feel as you take action, and other similar visualizations. Imagining the various sensory aspects of the act of achieving your goal helps instruct your mind and body to move, to assume a particular attitude, to respond verbally and non-verbally to other people, and to communicate your intentions in different ways. By meditating on what your personal strengths and weaknesses are, what potential you have, what developments and changes you can make, what actions you can take, and what future you can create with all the resources you have access to, you can put yourself in a better position to successfully achieve what you set out to do. Guided imagery meditation can help you identify your purpose, stay on track, and settle for no less than attaining the goal you have in mind.